The Standard & Poor’s Ratings Services, on April 19th (1 week ago today), stated that they have not changed their view regarding the credit worthiness of Goldman Sachs & Co. (NYSE:GS). The news that the SEC has filed a law suit against Goldman Sachs claiming fraud has, at least up to this point, not affected their (Goldman’s) credit ratings. The SEC has filed a civil complaint against Goldman Sachs alleging that in structuring and marketing a synthetic ABS CDO in 2007, Goldman Sachs failed to disclose the role that a hedge fund played in the portfolio selection process and nature of the hedge fund’s investment position with respect tot he CDO. The Standard & Poor’s Ratings Services did, however, issue a stern warning to Goldman Sachs and investors that the fraud complaint and other recent criticisms of Goldman’s business practices could raise issues that ultimately could damage Goldman Sach’s reputation with investors, clients, creditors, and counter-parties involved with Goldman’s businesses. 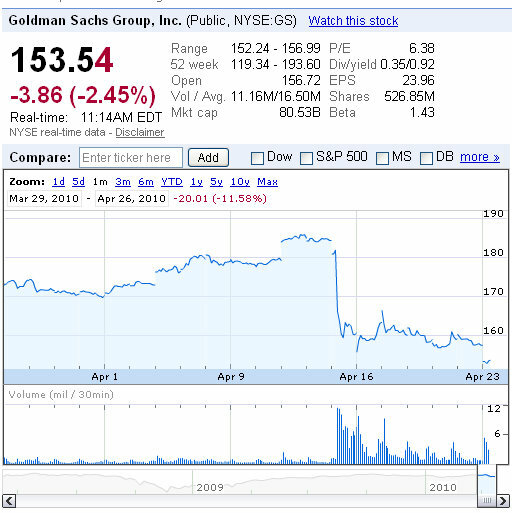 As you can see in the chart below, the negative impact from the SEC fraud case filing had an immediate impact not only on Goldman Sach’s stock price, but also on the entire market as a whole. The day that the SEC issued the news about the law suit against Goldman Sachs, the entire stock market took an immediate dive south – across all stocks and sectors.